NKBA Alabama is the local chapter that brings together local Alabama Kitchen & Bath distributors, retailers, remodelers, manufacturers, fabricators, installers, designers, and other professionals – and provides a resource for local consumers to research, educate and connect with Alabama Kitchen and Bath professionals. 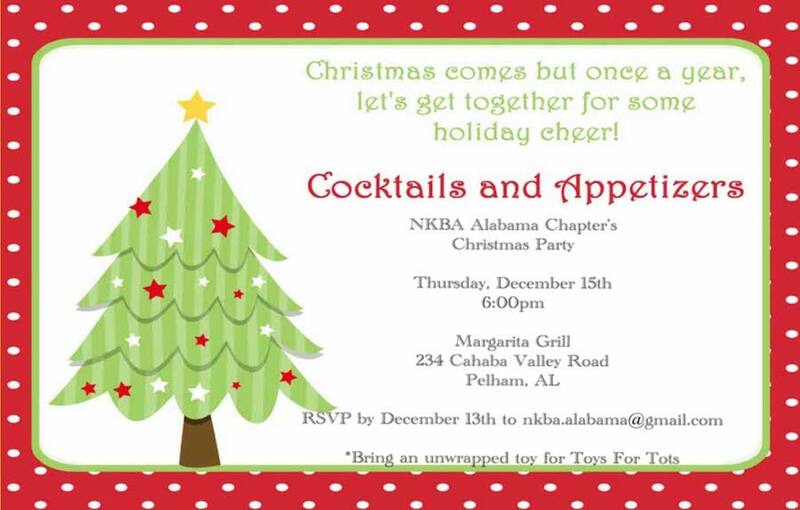 Please join us for the NKBA Alabama Chapter “Ugly Sweater” Christmas Party. Please join us for a glass of wine and hors d’oeuvres at this fun free event! RSVP below to Lurenda. Join us for a glass of wine and learn about stone! Your Life is More than a #Hashtag! #RealTalk begins promptly at 5:15 p.m. Hosted by GBAHB & NKBA ALABAMA. Want to see what our amazing vendors have been up to recently? Well, swing by and take a look for yourself! You’ll see countertops, flooring, plumbing, cabinets, tile, and so much more. MULTIPLE VENDORS! DOOR PRIZES! FOOD~DRINK~FUN! Please join us for Cocktails & Appetizers! “SAVE THE DATE” for a day of CEU’s and lots of fun learning! Tabletop Sponsors are available for $150.00 each. 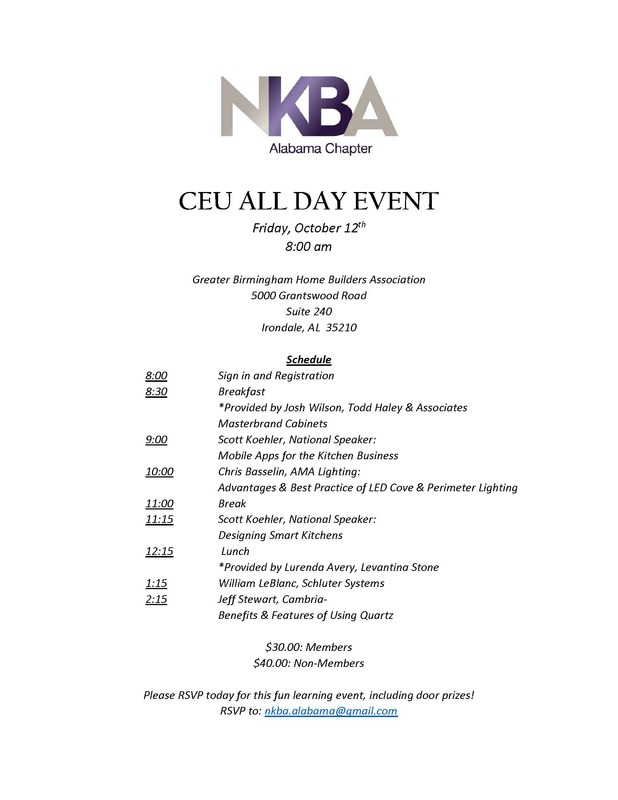 Please join us for a “Lunch and Learn” CEU Event presented by Kohler! 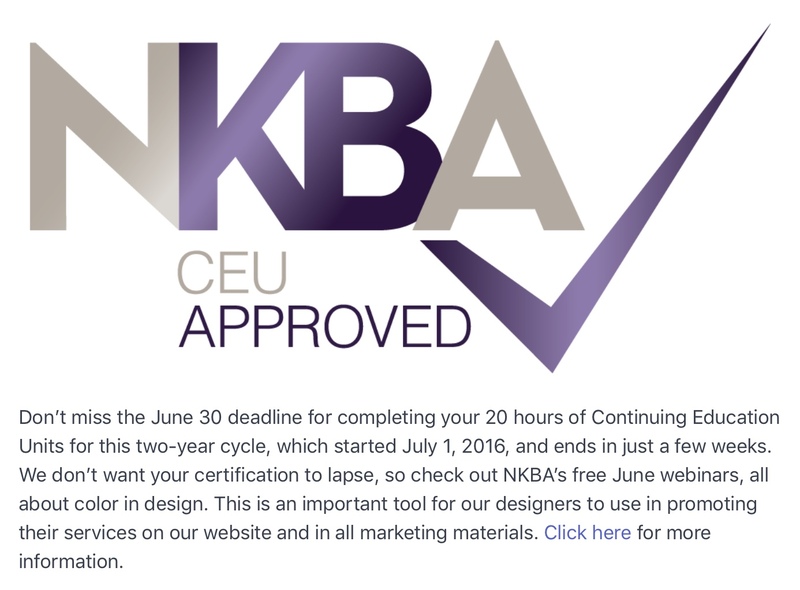 Are you interested in becoming an NKBA Chapter Officer? Don’t miss your chance to nominate yourself for this exciting opportunity! NKBA Chapter Officers act as representatives for the industry and their members, elevating their careers along the way. Nominations are due by June 17th! Please join us Friday, May 20th for a fun CEU event! “SAVE THE DATE” For A Day of CEUs! *The sponsor will receive signage at the event/recognition on the invite/10 minute podium time to promote their product and services. Giveaways and Grand Prize will be drawn at the Networking Social at the end of the event.